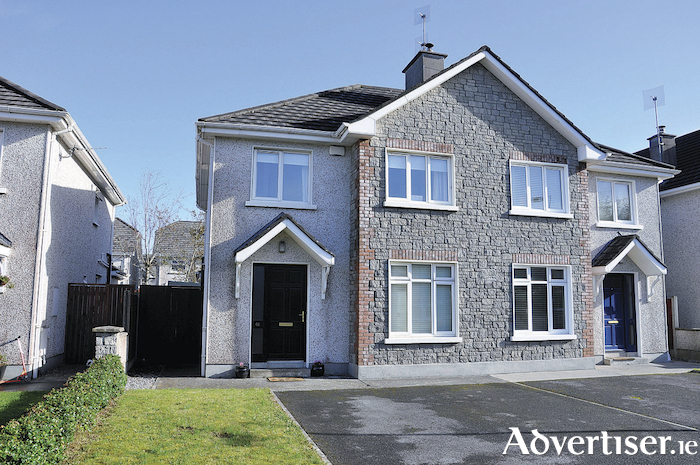 Mullery auctioneers is currently offering for sale a superb three bedroom semidetached residence situated in the well-established and beautifully maintained development of Clochog in Oranmore. Number 46, which is owner occupied and well presented, benefits from gas fired central heating, PVC double glazed windows, an alarm, a shed to the rear, and a large attic space with Velux window, which is accessed via a pull-down ladder. The ground floor accommodation includes an entrance hall with understairs guest wc, and a spacious living room with open fireplace and double doors leading through to the kitchen/dining room. The kitchen/dining room is to the rear and is well fitted with a range of wall and floor units and a breakfast bar. Off the kitchen is a utility room. Moving upstairs, there are three bedrooms. The master bedroom has an en suite and there is a main bathroom which is fully tiled. Outside there is a driveway and lawn to the front and to the rear is a lawn, patio, and shed. Clochog is ideally situated within a short walk of the centre of the bustling village of Oranmore which boasts a wide range of amenities including schools, church, shops, pubs, restaurants, and shopping centres. This superb residence would be a wonderful home combining spacious accommodation with an excellent location in the ever popular village of Oranmore. For full details see www.mulleryauctioneers.ie or call Mike Mullery who is dealing with the sale on 087 6424106.